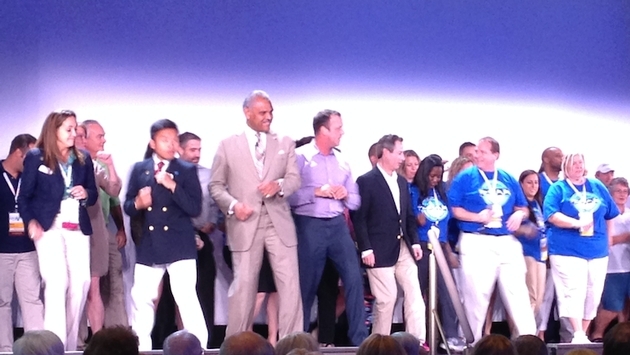 Sister travel agent networks CruiseOne and Cruises Inc. kicked off their annual conference with a dance-off, record attendance and an alternately funny and touching speech by new Carnival Corp. President and CEO Arnold Donald. Drew Daly, general manager of network engagement and performance, welcomed attendees on Nov. 9 with news that they are part of the organizations’ largest national conference ever, with more than 900 participants. The event is taking place during a weeklong Eastern Caribbean cruise on the new Regal Princess, which was just christened on Nov. 5. Three teams competed, and both Donald and Daly were captains; the third team was led by a cruise staffer and comprised travel agent volunteers from the audience. Donald made some impressive moves, but the three judges voted the travel agents the winner. 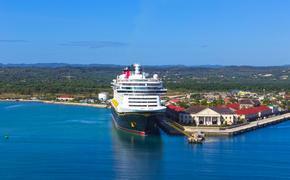 Donald also provided updates on Carnival Corp.’s nine cruise brands, saying that Carnival Cruise Lines has made “significant progress” toward strengthening the brand after the Carnival Triumph and other ship incidents. He said he is sorry to see President and CEO Gerry Cahill leave the company; Cahill announced he is retiring effective Nov. 30, but will stay on as an adviser. Cahill’s replacement has not been named, but Donald said the person selected will “reflect the brand” known for its Fun Ships and family-friendly atmosphere. Donald answered questions submitted by travel agents in a Q&A with David Crooks, senior vice president of product and operations for parent company World Travel Holdings. Donald said one goal is to increase cruise fares, which in turn would boost commissions earned by agents. He said “a dramatic increase in capacity” in the Caribbean this year dampened fares, but that “a near double-digit reduction” is expected next year so prices could move upward. “Yields are heading in the right direction and so is the booking curve,” he said. To illustrate his commitment to the trade, Donald said he was in Fort Lauderdale for the Regal Princess christening on Nov. 5, then flew to Genoa, Italy, for the Costa Diadema naming on Nov. 8, and then flew back to Florida to talk to the conference Nov. 9. Donald closed his remarks by expressing gratitude to the travel agents. “Thank you for everything you do,” he said.